Gottesman’s book should be enthusiastically and widely read, and hopefully should set the tone for many more conversations on the status of critical educational studies, its epistemologies of ignorance, its sustenance in uncertain and fragmented times, and its future. Isaac Gottesman establishes himself as an intellectual’s historian. Never before has there been such a detailed accounting of the Educational Left. He does more than trace the critical turn in education from Marxism to feminism to critical race theory. Gottesman provides the analytics that force us all to struggle with the burdens of the past without a clear path to the future other than the insistence on social justice. Books like The Critical Turn in Education only appear once in a generation. We don’t just read it, we are deeply affected by it. 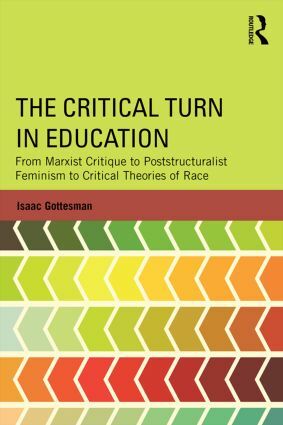 Isaac Gottesman's smart little book represents our first truly critical history of the "critical turn" in education. As Gottesman shows, self-described critical theorists have too often insulated themselves within their own fiefdoms. His work will help all of us look beyond our narrow domains, to a much broader realm of academic scholarship and--I hope--of popular influence. Isaac Gottesman is an Assistant Professor in the School of Education at Iowa State University.